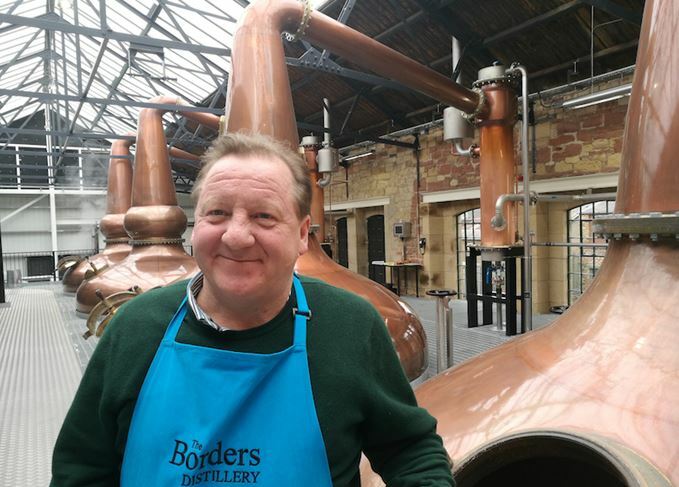 John Fordyce is director and co-founder of the Three Stills Company, owner of the Borders distillery in Hawick, which opened in 2018. He talks to Gavin D. Smith about his varied career – and why he’s not making whisky in a ‘Lowland’ style. ‘I got into whisky through selling sewing thread in Brazil. I worked for Coates, the thread-makers, who were still based in Paisley, near Glasgow, at the time. I was in Australasia, Africa, and Venezuela for them. I left to join another firm with a base in Paisley – William Grant & Sons, becoming regional director for spirits in parts of Europe and in Asia. ‘I’d been born in Dumfriesshire, but brought up all over the world because my father worked for BAT (British American Tobacco). We’d be outlawed now for that. I studied politics at Glasgow University, so I was qualified for nothing. ‘After Grant’s, I moved to Portugal in 2004 to run a vineyard. I’d lived there previously, and it was a really interesting period for the wine industry. I spent nine happy years there. At the time, there was a massive reduction in drinking volume, with a compensatory increase in value per litre, and a lot of interest at consumer level in regionality of wines. ‘There was growth in consumer curiosity about how stuff was made, not only wine, and we were seeing new vineyards and new ways of selling wine. There was a single varietal focus – Australia, for example, with Shiraz. ‘Wine blending became more interesting, and people were talking about fermentation times, different ways of maturing, different woods, and so on. It all became much more involving for the consumer. ‘I was based 150km from Lisbon, in the cork forests. I had my own brand of red wine and I did lots of contract work with both reds and whites for other wineries. ‘However, I was wanting back to Scotland, having been away since 1985, and I was starting to see some of the same dynamics in whisky that had become prevalent in wine. Production methods and provenance were becoming more interesting. ‘This was very fertile ground for new businesses, so I came back to Scotland and teamed up with three friends who had extensive experience of wine and spirits. We just made some decisions: set up in the Borders, make single malt and revive an old industrial building to do it in. ‘The last distillery in the area had been in Kelso, and that closed in 1837. The fact that there were no other distilleries in the area was an obvious advantage for us, and we had proximity to great malting barley. ‘We chose Hawick because it is a manufacturing town, particularly associated with textiles. People had no difficulty with the idea of working shifts and working in a factory type of environment. Also, it’s full of beautiful old buildings. Ours was once home to the Hawick Electric Company, and mainly dates from the 1880s. ‘We use a borehole for processing water and the River Teviot close by for cooling water. Since the 1770s, that has been going on in Hawick, using water for dyeing and for power. ‘We have a modern distillery in an old building in a traditional manufacturing town. It’s funded by shareholders, and we directors tend to mix and match our roles. ‘We installed a Carterhead still to make gin and vodka from the start. White spirits, plus our visitor centre and shop, provide revenue, and we also have a separate whisky blending business. ‘We make a blended malt called Lower East Side and a classic blend named Clan Fraser. We buy whiskies in the market, like any broker, and they are blended to our recipes, with 98% of sales being abroad. ‘We’re making single malt whisky in our own style. I don’t know what “Lowland” means. What does the work Brian Kinsman is doing at Ailsa Bay in Girvan have in common with David Prior’s Bladnoch operation, and what do either have in common with the Clydeside distillery in Glasgow? ‘Why is there an “Islands” category and also an “Islay” category? Isn’t Islay an island? Anyway, the regional designations are no longer enough for consumers. ‘We’re not making “Lowland” whisky, we’re making Borders single malt. We set out to produce whisky that’s elegant, estery and reasonably dry. We have downwards-sloping lyne arms for a lighter style of spirit, and boil balls on the stills, which are big vessels. We’re very explicitly configured for what we’re doing. ‘We’re using 100% Borders-grown barley, and we won’t be making any peated whisky. There’s no tradition of using peat here, because you had cheap coal available both to the north and the south of the region. ‘Based on our new make, I think it should be five years or so before we give people a first look. But it will be ready when it’s ready. ‘The Borders is a very beautiful place to live, but what I really like is its history, its customs and its rivalries. It all feels quite subversive from outside. I’m used to being an ex-pat, an incomer, so I’m fine with that. ‘Historically, the Borders was a culturally distinct area. It has a very turbulent history, and the word “blackmail” was invented here. Everyone interested in the place should read the wonderful book The Steel Bonnets by George MacDonald Fraser. ‘I follow politics and read a great deal, and I play golf and shoot, but really, I love my work. The Scotch whisky industry is one where it’s hard not love your work. It attracts people who want to please other people and who enjoy gossip. ‘It’s a tight-knit world and, when we set up the distillery, we got a lot of great advice from people in the industry – especially about what not to do, which was very useful. Two new £40m malt and grain distilleries are to be built in Jedburgh in the Scottish Borders. Scotland is set to welcome seven new distilleries in 2017, plus the relaunch of an old favourite. Whisky enthusiasts have voted for Peebles as the preferred location for a new Borders distillery. The blender has withdrawn its single grain brand after postponing plans for a Borders distillery.